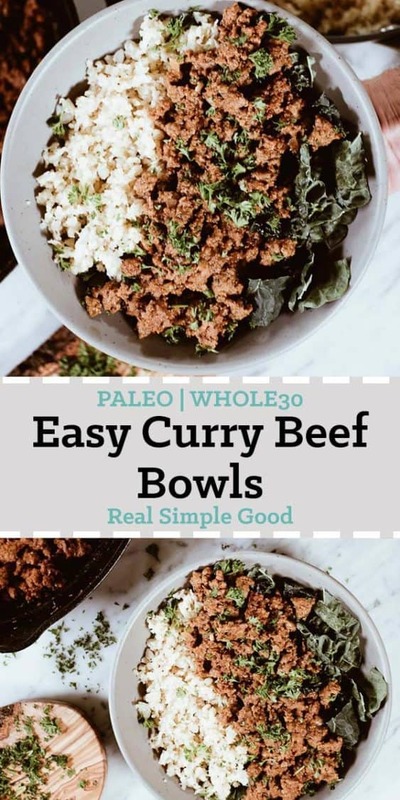 Today we are sharing with you our newest favorite dinner – these Paleo and Whole30 easy curry beef bowls! It’s become a quick favorite because it’s SO fast and easy to make and extra delicious too! We often strive for 30 minute meals and were real pleased when this one came in WAY under! 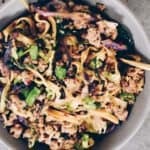 You’ll have these easy curry beef bowls on the table in just 20 minutes! Seriously, it might be one of the easiest recipes EVER! Just make sure your white or cauli rice is ready to go so you’re just assembling your bowls when the beef is done. 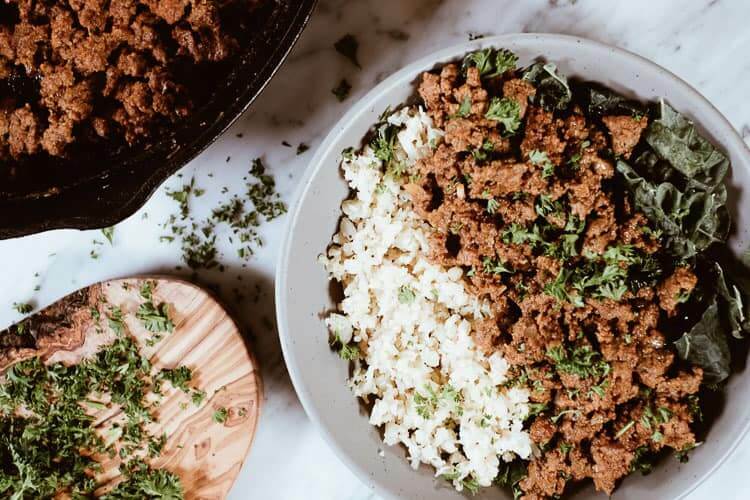 If you are making these Easy Curry Beef Bowls as a Whole30 meal, make sure you use cauliflower rice rather than rice or quinoa. But…if you can tolerate rice or quinoa, go for it! This is a personal decision for everyone and it definitely depends on what your goals are. Yes, rice is a grain and yes plain white rice doesn’t really have much in the way of nutritional content. 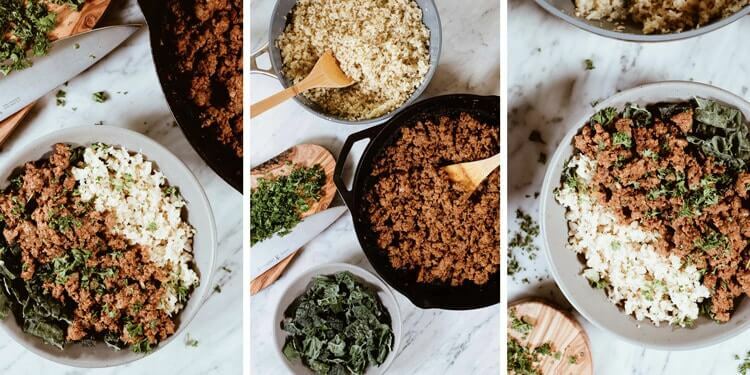 All of that said…if you’re a woman and if you’re like me you might need a little bit of grains in your life to keep things moving – digestion wise. Sorry if that is TMI. Ok, I’m not sorry – that’s just real life! 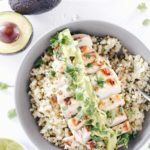 Quinoa can be a great option because it has protein, is gluten-free and also has more vitamins and minerals, potentially making it a better option than plain white rice. It’s also technically a seed, rather than a grain. 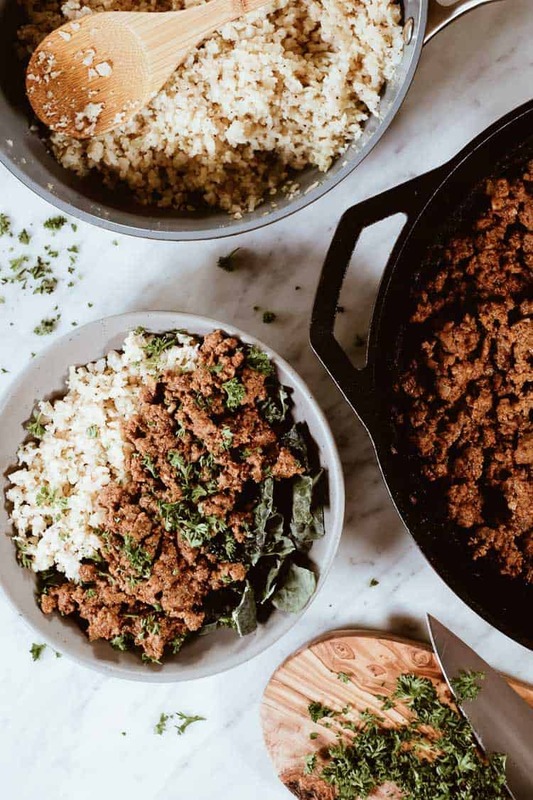 The outer coating of quinoa, however, gives Paleo enthusiasts pause because it can potentially lead to digestive issues. Ok, and if you’re trying to eat low carb, you’ll also think eating quinoa is ill-advised. If you’re still with me though…take the time to soak your quinoa for 30 minutes prior to cooking and then thoroughly rinse it. This is an easy thing to do when you meal prep. Soak and then cook quinoa and store it in the fridge to have on hand during the week. 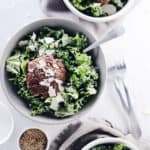 It’s easy to add to salads, these easy curry beef bowls and when you’re throwing together leftovers to make lunch or dinner. Read this post for more on quinoa and its health benefits. I’m playing with quinoa because not only does my digestion seem to need some grains/carbs, but the health of my adrenals seems to require a little too. 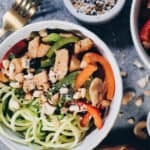 I’m working with a naturopath locally and definitely recommend it for anyone trying to dive deeper into their health issues and achieve wellness. 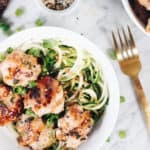 While eating a strict Paleo diet has served me well and was a great launching pad for changing my health story, I’m at a point where I’m willing to play around a little and reintroduce things to figure out what MY PERSONAL perfect diet is. It will always be predominantly real food, mainly Paleo – but I’m open to listening to my body and giving it what it needs to feel like my most vibrant self. Ready for a super quick and delicious meal? 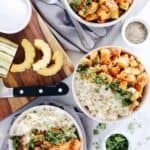 Try our easy curry beef bowls! Pair them with whatever version of rice makes sense for you and your body. Then, let us know what you think by leaving a comment below. Also, take a photo and tag us on Instagram @realsimplegood, so we can check it out! Today we are sharing with you our newest favorite dinner - Easy Curry Beef Bowls! It's become a quick favorite because it's SO fast and easy to make and extra delicious too! Combine seasonings in a small bowl and set aside. Chop shallot. In a large skillet over medium heat, add coconut oil. Once melted, add beef and shallot. Break up beef and cook until almost cooked through, about 6-7 minutes. Add seasoning and mix to combine. Then, add tomato paste and stir for 1 minute. Add the coconut milk and bring to a rapid simmer, then reduce heat to medium low, cover and simmer for 3-4 minutes until the beef is cooked through. Once beef is done, assemble bowls. Start with a bed of greens and add cauliflower or white rice. Top with beef mixture and sprinkle chopped parsley on top. Enjoy! 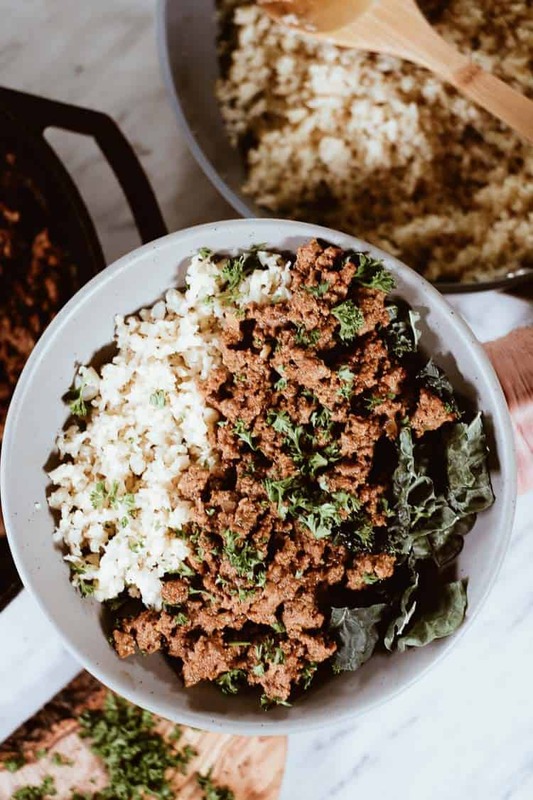 Nutrition facts are an estimate provided for those following a Ketogenic or low-carb diet and include cauliflower rice for this recipe. See our full nutrition information disclosure here. Terrible terrible terrible. Most breads, cookies and brownies I”ve made taste like your eating gravel. Everything falls apart and isn”t worth eating. I made your blueberry muffins above. Forget it. Makes me want to forget being on a paleo diet. The muffins rose in the oven and fell when I took them out. I stuck a toothpick in three muffins. Toothpick came out clean. Let them sit and cool. They fell more. I couldn”t pull the paper off very easily and when I got it off, the muffin looked liked they weren”t fully cooked. I left them in 20 min. And used a toothpick. Trash is all I ever get when I try to bake with any of the paleo flours. This is depressing. I love to bake and I”m not able to on paleo. I try very hard but I don”t know what I”m doing wrong. You just left this comment on a recipe for beef curry bowls, are you sure you have the correct website? Either way, best of luck going forward – all you can do is keep trying until you find the recipe that works for you. 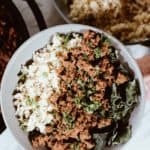 Add the cauliflower rice to a large salad bowl. Meanwhile, cook the quinoa. Combine the quinoa and water in a small saucepan with a pinch of salt and bring to a boil. 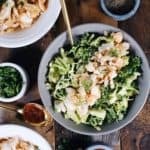 What type of greens did you use for this recipe? Would this be good with one of your sauce recipes? Let me know which one you think! Thanks! Oh great! I actually meant a sauce, no a seasoning. I’m definitly going to use th curry seasonings. 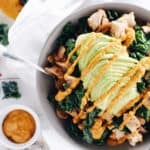 I’ll check out the avocado dressing you listed! I don’t love Dijon mustard so I wonder if I can leave that out? Any other sauce suggestions? Thank you! Trying this tonight! Got it! You could definitely try the sauce leaving out the dijon. Or if you’re looking for a store-bought sauce, check out the brand Tessemae’s, which is available at health food stores like Whole Foods and Amazon! They’re a great ready-made option and then you can choose whatever flavor sounds yummy to you! This curry beef bowl is perfect! I want this very soon! It’s one of our favorites! We hope you love it :). Made this tonight , super easy and full of flavor. 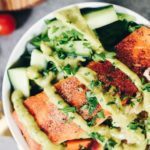 I used kale and jasmine rice in my bow, and I made the avocado dressing mentioned in the above comments. The bowl itself was good without the dressing, but I’m glad I made the dressing because it upped the flavors and my husband is a sauce guy and liked it much more than if it didn’t have the dressing. Thanks so much, very tasty and I feel good about what we are eating. This makes my mouth watery! 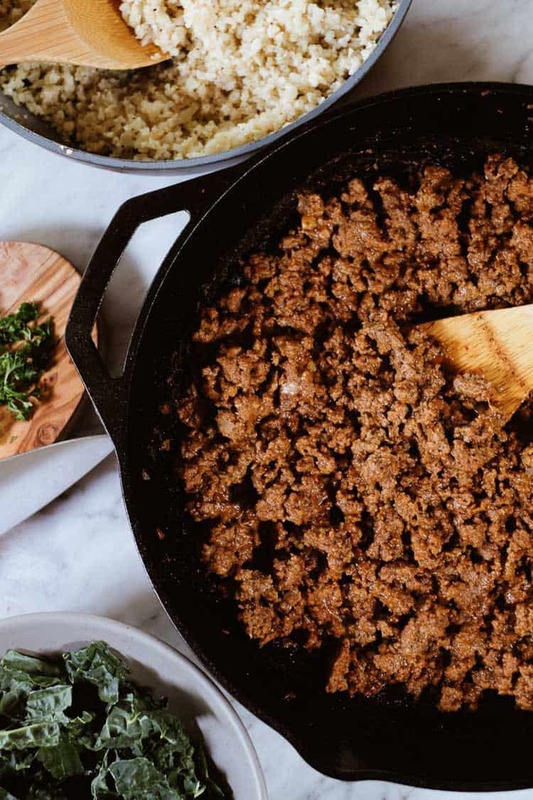 Thank you so much for sharing this curry beef recipe! Curry and beef is a killer combination for me. I love both so this one I can’t wait to try. Thanks for sharing!